The Times of February 21st, 1931, reports on an exhibition by the Gordons in the Twenty One Gallery (which had opened on February 11th). "What distinguishes the drawings and paintings of Spain, Portugal, Sweden, U.S.A., England, and Germany by Mr. and Mrs. Jan Gordon at the Twenty-One Gallery, 15, Mill-street, Conduit-Street, is the effort to combine topographical and human interest with artistic arrangement. They take a middle place between records of fact and the kind of impression which pretends that it does not know where it came from. 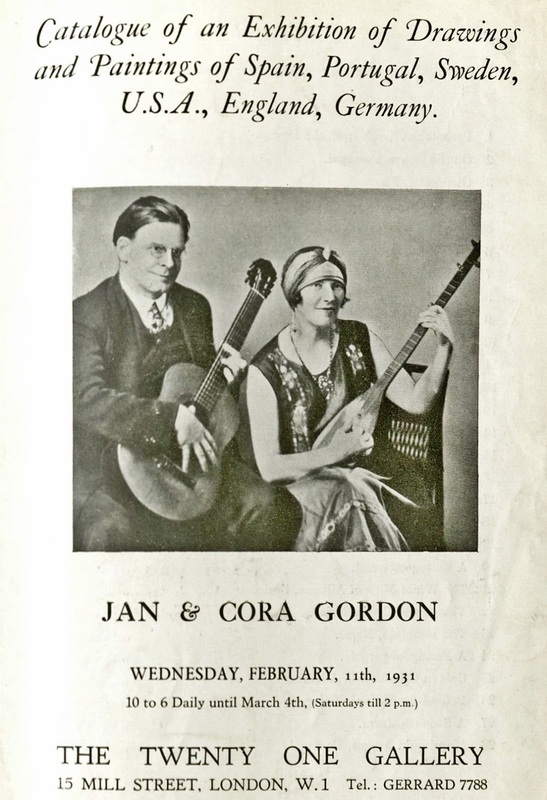 By this time it would be an affectation to ignore that "Jan and Cora Gordon" are habitual globe-trotters, as apt with the pen as with the brush and pencil, and this exhibition may be supposed to represent many adventures which have been described in print. It shows that one secret of the success of the artists is that they are interested in what they see for its own sake. Most of the paintings and drawings have some definite artistic motive, but the subject interest, with its bearing on local character and custom, is never ignored. Of the two Mrs. Gordon appears to have the quicker artistic sensibility, but there is little to choose between the two "on balance." There are 60 works in all, and "Gloucester, Maine," "An Albanian Dancer, " and "On the Pacific," by Mr. Gordon, and "The Fountain, Aregos, Portugal," "A Portuguese Street," and "A Corner of Spain," by Mrs. Gordon, are among the most successful." The diary of my grandfather (Ashley Smith) records, for 21/3/1931, "Had quite a nice picture from the Gordons - one of Jan's." This was probably No. 6, "New Forest Glade" which was offered at 16 guineas. (my thanks to Melanie Howard for finding this at the National Art Library at the V&A).